Cultural Heritage Research Services, Inc. | CHRS, Inc. is pleased to announce receiving the Preservation Alliance for Greater Philadelphia’s 2015 Grand Jury Award! CULTURAL HERITAGE RESEARCH SERVICES, INC.
CHRS, Inc. is pleased to announce receiving the Preservation Alliance for Greater Philadelphia’s 2015 Grand Jury Award! 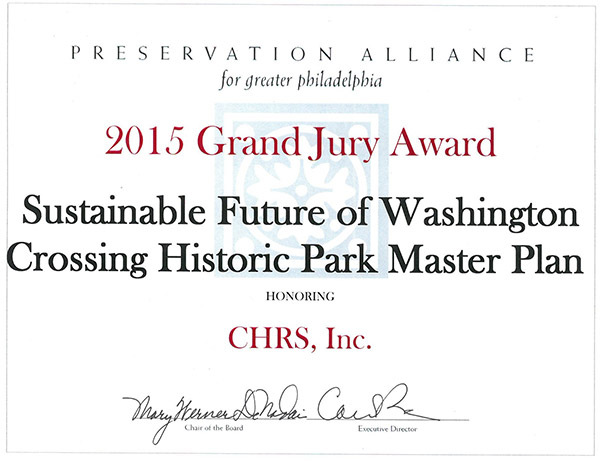 CHRS, Inc. is pleased to announce we have received the Preservation Alliance for Greater Philadelphia’s 2015 Grand Jury Award as a member of Marianna Thomas, Architects’ team for the preparation of the Master Plan for the Sustainable Future of Washington Crossing Historic Park.